With its innovative force-absorbing quick release strap and multi-directional ring, the Acceleration Trainer gives athletes the resistance and quick release needed to increase speed and power. Acceleration and first step speed are critical components of any sport. 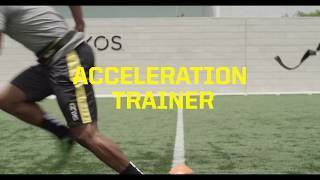 Using proven overload and release training methods, the Acceleration Trainer helps athletes at all levels build first step quickness and top-end speed. From starting speed to acceleration to top-end power, athletes and coaches alike know speed is a must for serious performance. The Acceleration Trainer puts the dynamic resistance, overload and release method world-class racers use in your hands to add new levels of speed and power in any athlete. The Acceleration Trainer lets your athletes build their lower body and leg power through proven overload training. And with its unique force absorbing quick release strap, you won’t have to worry about over-pulling or having an erratic grip that can interfere with training sessions. With its multi-directional ring and quick release design, the Acceleration Trainer gives you the power to train athletes in any direction. At the same time, it provides the instant feedback and seamless release athletes need to fine-tune performance.